Twenty years ago, I took my chance to live and work in London. Armed with a precious year-long research pass to the British Library, I visited its main Reading Room, housed inside the British Museum, nearly every day. This was heaven for a writer: I would enter the Reading Room’s massive, high-domed circular space lined with books, hear the hushed sounds of movement, breathe in the sweet and musty smells of the room’s long-stored tomes, and let a magnificent rush of history wash over me. This was, after all, not just a repository of collected objects; this was—and still is—the actual space where many of the fathers of the modern world sat, worked, thought: Karl Marx, George Orwell, Oscar Wilde, Samuel Beckett and Mahatma Gandhi all formed their stories here. But as moving as the room itself can be, the process of getting there was often dreary and confusing. I would work my way down a dim and dingy hallway past the human-headed winged lions from Egypt, arrive at the Rosetta Stone (sitting out in the open and very touchable), then hesitantly wend my way to the reading room. How that experienced has changed. Enter the museum today, originally established in 1752 and offering one of the world’s most wide-ranging collections, and soon you come upon the Queen Elizabeth II Great Court. Where once stood decaying bookstacks housing the British Library’s voluminous collection of much of the world’s most important literature is now a magnificently modern open space with a vaulted glass ceiling of 3,312 triangular glass panels that link four original outer walls of the museum—creating the largest enclosed courtyard in Europe. The feeling, especially for one who remembers those dusty old days, is awe inspiring. The world’s oldest public museum has a new heart, complete with revitalized shops and cafés and a central meeting area that provides visitors an inspiring focal point to begin their exploration. The majestic Reading Room, with a new limestone exterior and entrance, is still at the center, but now is open to the public and proffers 25,000 volumes tied to the museum’s collection. 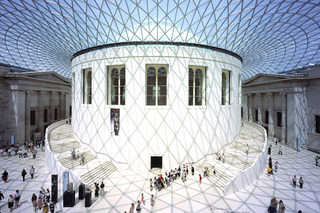 Designed by the renowned architect Sir Norman Foster—and one of several important new structures in London created by his firm—it’s hard to understate the Great Court’s impact. I visited it on a gray and rainy day, in a city that has many such days, but when I entered this space, the light grew brighter, even cheery. Visited by an estimated 4.5 million people a year and open Thursday through Saturday until 11 p.m., the Great Court has become a meeting place in its own right for tourists and Londoners alike. Last June, during a special Michelangelo exhibition, the museum stayed open until midnight, a British Museum spokeswoman told me, “so that people could come after theatre or dinner.” Many visitors may still head straight to the vast mummy collection on the second floor, study the hieroglyphics on the Rosetta Stone (now in a glass box), look at the cabinet of curiosities in the newly refurbished King’s Enlightenment Gallery or linger inside the glorious Reading Room, but they all will inevitably gaze upward at the spectacular glass ceiling that has breathed new life into one of the world’s great museums.